The fighting at Heth’s Salient Battle Site was part of the Spotsylvania Campaign during the American Civil War. On May 12, 1864, Grant ordered General Ambrose Burnside to attack the Confederate Army at a bulge in their forces called Heth’s Salient. It was situated on the east side of the focus called the Muleshoe Salient during the struggle for the Bloody Angle. In a remarkable coincidence, General Lee of the Confederate Army also ordered his troops to attack at the same point and time, with the goal of relieving pressure on his troops elsewhere. Lee wanted to take control of the Federal line, similar to what General Longstreet did at the Wilderness battle. He also wanted to create enough chaos at Heth’s Salient to draw pressure away from the Bloody Angle where neither side was gaining any ground. Both sides accrued considerable damages during the battle (Rhea 294-296). The Confederate Army brigades were simply not big enough to overpower the Union brigades, but this struggle does demonstrate General Lee’s superb ability to lead his troops and make well-thought out decisions when only given a small window of opportunity in which to make those decisions (Rhea 301). 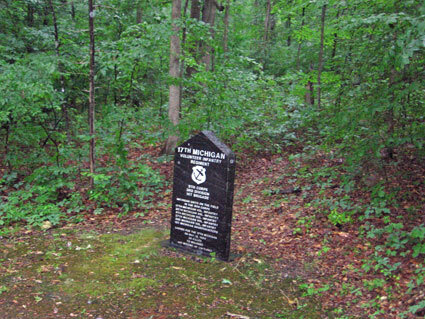 A monument was erected in 1997 to commemorate the 17th Michigan Regiment that fought during the battle of Spotsylvania. They suffered heavy damages during the battle on Heth’s Salient, losing nearly 200 men in only 30 minutes (virtual tour stop…). “17th Michigan,” National Park Service (accessed April 15, 2008). Gallagher, Gary W. The Spotsylvania Campaign. Chapel Hill: The University of North Carolina Press, 1998. “History of Wilderness and Spotsylvania.” National Park Service: US Department of the Interior http://www.nps.gov/frsp/wildspot.htm (accessed March 27, 2008). Rhea, Gordon C. The Battles for Spotsylvania Court House and the Road to Yellow Tavern May 7-12, 1864. Baton Rouge: Louisiana State University Press, 1997. “Virtual Tour Stop, Heth’s Salient.” National Park Service: US Department of the Interior http://www.nps.gov/frsp/photosmultimedia/heth.htm (accessed March 27 2008).